Discussion in 'Toilet Forum discussions' started by YamahaYG68, Feb 7, 2019. I have a question concerning our Crane wall mount toilet carrier. This is the only cracking, the plaster around the other three attachments is fine. I am assuming noises etc. is not a good sign and thinking some action is needed. 2.) Replace with conventional toilet, or rear outlet toilet. 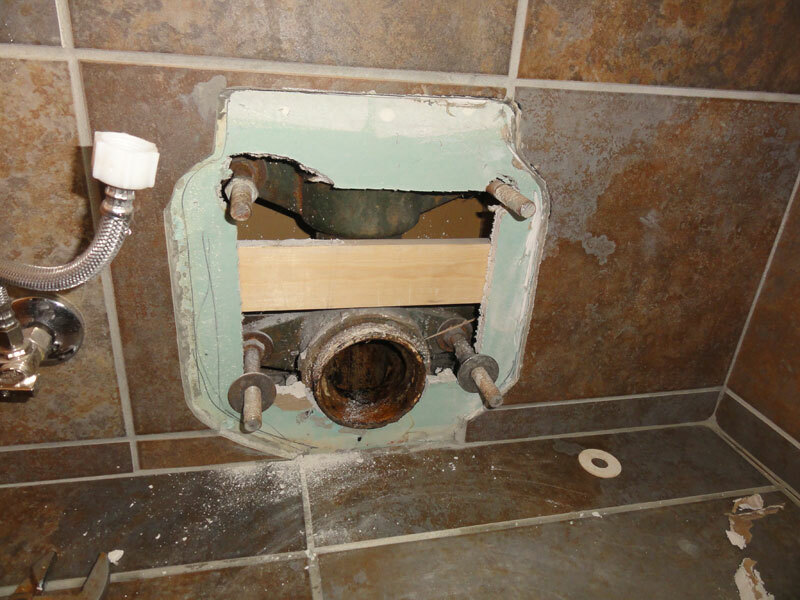 I mention rear outlet toilet because the drain piping configuration is a challenge for a conventional toilet. - Wall studs are beefed up where the toilet is mounted, you can see this by the wall configuration. Sometimes the carriers are a little loose in the wall. The wood dries out and becomes smaller, and the bolt holes are a little larger than the bolts. Pretty common, and I don't normally worry about that. You're talking just a little movement and it's likely already maxed out. We're due for a repaint anyway, so it might be worth cutting a bit of plaster and seeing if things could be tightened up. If I was to do that, do you know if dimensions of the carrier are available, it would minimise the "collateral" damage. So in your opinion, it is not likely the carrier itself is cracked or broken (a load question, I know). 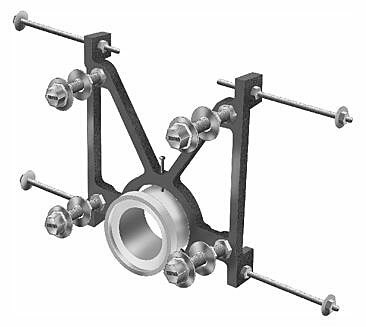 A typical carrier for wall mount. This one is back to back. Would I be correct to assume just because the toilet is a crane, that the carrier may have been from a different manufacturer? The companies that make toilets do NOT make the carriers. It would be almost impossible to damage the carrier, especially since THAT upper nut is typically the "loose" one so you do not break the toilet when you tighten the nuts. It would be almost impossible to damage the carrier, especially since THAT upper nut is typically the "loose" one so you do not break the toilet when you tighten the nuts. That's good news (almost impossible to damage) since I would prefer not to replace everything, and yes, that one is loose. I have found some phone contacts for Wade and I will call them tomorrow about the noise and cracked plaster, hopefully they may be able to provide some suggestions. I will post what I find out, as soon as I get something, I suspect it will take a call to them then following up with some emailed pictures. Update, not a lot to report but I am getting help from a very accommodating & helpful tech, rep. at Wade. He is searching for old drawings of that this 50 year old unit might look like, which would be useful if I decide to cut into the wall to see what is going on, and hopefully correct it. He is looking for a bottom outlet, 3" copper connection, residential unit that as near as I can tell, fits in a wall with 2 x 6 studs. 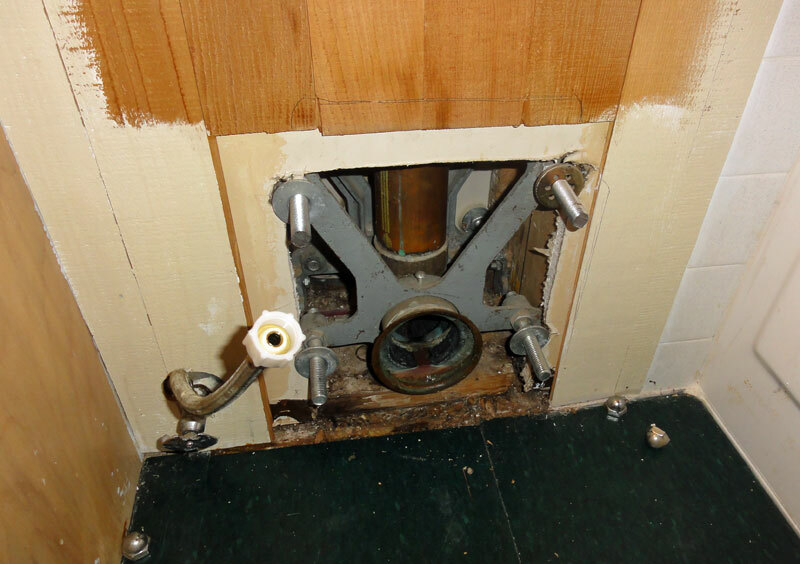 I would prefer to know what I am looking at before I decide to do this but will likely pursue this option because the floor joist and piping make replacement with a bottom connection toilet very challenging. Yamaha: For what it's worth, Terry replaces a lot of wall-mount toilets with brand-new ones, and there are some nifty ones. Point being, it's not as weird a device/installation as it may seem to some. There are some regions where these were very popular. I would also bet that the drawings for the 50-year-old carriers look a heck of a lot like the drawings for the current carriers. And when you see how they are designed and what they are made of, HJ's comments about it being impossible to damage them make perfect sense. And most anything HJ says you can take to the bank. The carriers are quite standardized, meaning that you can hang basically any American brand/model of this type of toilet on any manufacturer's carrier. That it had a Crane on it doesn't mean that tomorrow you couldn't put an American Standard Glenwall on it. Or a Gerber. (I know you're not going to, but my point being that the carriers, like toilet seat holes, are generally-standardized. From a cleaning point of view, wall mount would sure be great. The Crane toilet we have works great, the only concern I have is the noise from inside the wall when someone sits on it, and, I put a level on it and the upper right corner (when looking at the toilet) is out, the toilet has a few degrees lean forward. This and the cracked plaster is not a good sign, IMHO. I am assuming that if the mounting/carrier is not broken, that the connection to the wall studs/framing has come loose for some reason. Since the toilet works fine and the cost to replace would be fairly substantial due to the piping layout and joist, I would prefer to keep the Crane. It is looking like I will need to open the wall from the backside on the toilet (our dining room) and hopefully find something with the wall structure that can be repaired. In the mean time, I do have a padded wood block under the toilet to prevent any surprises (failures) , until I get this all sorted out. Terry probably nailed it in an earlier post...over time, the wood dries out some and shrinks. The bolts may only need to be tightened up in the wall to solidify things again. It's possible that a stud(s) cracked, and if that's so, you'd probably need to either replace it or reinforce it. You won't know until you open it up. When installing the toilet itself, you don't tighten all four bolts otherwise, you'll usually crack the toilet...you tighten three of them (tripods are stable) and only snug up the fourth. Terry probably nailed it in an earlier post...over time, the wood dries out some and shrinks. The bolts may only need to be tightened up in the wall to solidify things again. It's possible that a stud(s) cracked, and if that's so, you'd probably need to either replace it or reinforce it. Yeah, that's what I am hoping, some sort of effective repair would be preferable, for me, to some complete, new installation. You won't know until you open it up. Kinda like a game of chance I am not keen on cutting the wall but is it likely the best option and the only way of knowing what is going on. I can do a nice job on wall repairs, I did it last year in a kitchen upgrade. I'd never make money at it, too slow, but the results are good. When installing the toilet itself, you don't tighten all four bolts otherwise, you'll usually crack the toilet...you tighten three of them (tripods are stable) and only snug up the fourth. Thanks, I was aware of that, ceramics do not resist bending very well and breakage is not an option One thing I am not sure on, I have read that it is the upper right one you leave snugged up, I mean the upper right when facing the wall the toilet is mounted on, I'd like to confirm this is the preferred option. I spoke to a buddy today that owns a successful plumbing business, I asked him if it was his, what would do, answer; "I'd cut the wall and see if I could repair whatever is going on thither the wall/carrier"